This is "The BIG Maze." As the name suggests, it's quite large. The behemoth construction of twists, turns and dead ends is spending the summer at the National Building Museum, its sleek rectangular folds a stark contrast to the museum's grand Renaissance architecture. This crisp juxtaposition is just what design firm BIG-Bjarke Ingels Group had in mind, offering viewers a chance to view the historic museum in a new light. A windy, disorienting new light. 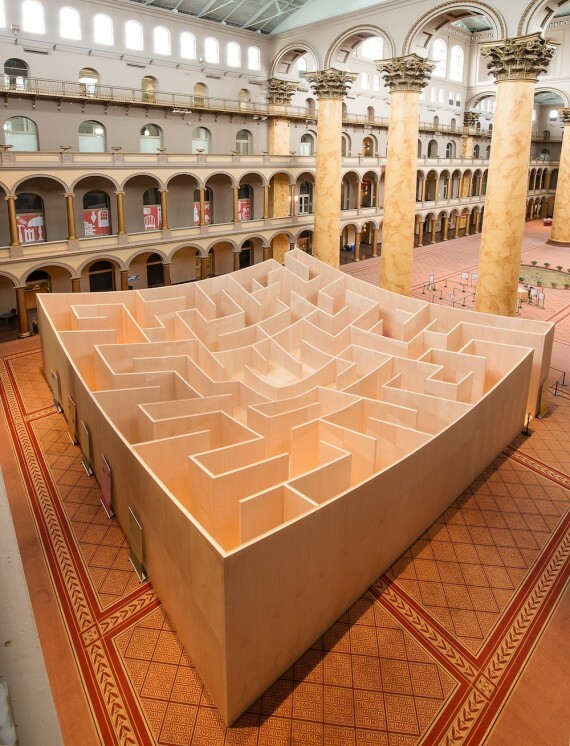 The BIG Maze, inspired by ancient labyrinths, gardens and hedge mazes of 17th and 18th-century Europe, and modern American corn mazes, isn't only contemporary in aesthetics. Unlike other mazes, as you get deeper into the maze the walls descend towards the center, offering a clear view of the path from start to finish. Upon defeating the maze, you get an aerial view of exactly where you've been. "As you travel deeper into a maze, your path typically becomes more convoluted," Bjarke Ingels explained of his vision. "What if we invert this scenario and create a panopticon that brings clarity and visual understanding upon reaching the heart of the labyrinth? From outside, the maze’s cube-like form hides the final reveal behind its 18-foot tall walls. On the inside the walls slowly descent toward the center which concludes with a grand reveal–a 360 degree understanding from where you came and where you shall go." The BIG Maze offers a rare chance to get lost in a familiar space, challenge your perception of your surroundings and enjoy a whimsical journey leading nowhere in particular. And if it's easier than most mazes, we're not complaining. The structure is open until September 1, 2014 at the National Building Museum in D.C.
Mike Kelley, 1987, Handmade craft items and afghans sewn onto canvas.